Dental implants are the next best thing to the real thing. Nothing replaces your natural teeth, but implant-supported crowns and bridges come as close as it gets. No dentist is more qualified to provide implant-supported crowns and bridges at a higher quality than a prosthodontist, like Dr. Tyler. As a Certified Dental Technician (CDT) before he became a dentist, Dr. Tyler gained invaluable experience, working several years in a dental lab. As a lab technician, he specifically specialized in fabricating crowns and bridges for both teeth and dental implants. These experiences are noticeable when you receive the technically proficient treatment he provides for his patients, particularly when doing implant-supported restorations. An implant-supported crown is a dental prosthesis that replaces a missing tooth by inserting an artificial titanium root (dental implant) into the jawbone and attaching an artificial tooth (crown) to it. It is either screwed or cemented in place and cannot easily be taken out. Implant supported crowns are a type of restoration used on patients who are missing only one tooth. It is a long-lasting and more natural-looking way of replacing a missing tooth. This type of restoration is able to replace a missing tooth from root to crown, which allows for it to work just as a natural tooth. An implant-supported bridge is similar to a regular dental bridge, but it is supported by implants and not by natural teeth. If you are missing multiple adjacent teeth, implant-supported bridges can replace them. Implant-supported bridges require two or more dental implants. Often two implants can be placed to replace three missing teeth when connected with a three-tooth implant-supported bridge. In other cases, when an implant-supported bridge is used, one implant may be indicated for each missing tooth. Besides allowing replacement of missing teeth, dental implants help prevent bone loss that occurs when teeth are lost. When no teeth are present the jawbone has no use, which leads to its deterioration. This shrinkage of the jawbone has esthetic consequences for your face (causing an older appearance). With the use of implant-supported prostheses, the bone is put to use, preserving it. An implant-supported crown or bridge looks and acts like a natural tooth or teeth. They fit securely even when you chew and speak. 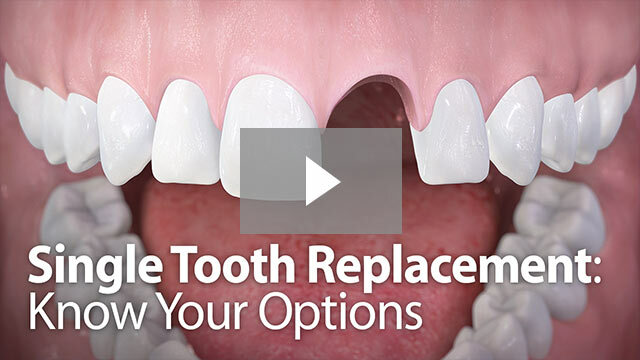 These tooth replacements do not allow the other teeth to move and shift, protecting your bite, other teeth, and jaw joint. In addition, implant-supported restorations do not involve treatment to your other teeth as compared to a tooth-supported fixed bridge or removable partial denture. What are Implant-Supported Crowns and Bridges made of? An implant-supported crown or bridge consists of several parts. The dental implant(s), which are made of titanium, are placed in the upper or lower jawbone to replace the root of the missing tooth or teeth. The abutment(s) can be made of titanium, gold or porcelain. It is attached to the implant(s) with a screw. This part connects the implant(s) to the crown or bridge. The restoration (the part that looks like a tooth or teeth) is the implant-supported crown or bridge. It is usually made of tooth-colored ceramics, porcelain, porcelain fused to metal, or composite resin. The crown or bridge is screwed or cemented onto the abutment. If the restoration is screwed to the abutment, the screw hole will be covered with tooth-colored composite filling material. No Messy Impression. One Easy Appointment. Combining Dr. Tyler’s certification in dental laboratory technology (CDT), and prosthodontic advanced education and training, with CEREC advanced digital technology your implant-supported crowns and bridges can be fabricated efficiently and exceptionally in a single visit. Click here to learn more about CEREC Single-Visit Technology. For a healthy individual with good oral hygiene, dental implants have reported success rates above 90-95 percent. Good oral hygiene is very important to the success of an implant-supported prosthesis. Although the implant and the restoration can’t decay, you’ll need to make sure the area around them is especially clean to prevent gum problems. Professional dental hygiene visits, particularly for dental implant maintenance, are important to avoid peri-implantitis, an inflammatory process that can damage the soft tissue and bone around the implant. Just like natural teeth, an implant prosthesis can wear and break. The lifespan of these restorations often depends on many factors, including oral habits, like teeth grinding. In many cases, a night guard is indicated to protect your implant and prosthesis. If you want the best option for replacing a tooth or multiple teeth make sure to ask your prosthodontist about dental implant prosthetics; they surely have a lot to offer. For any further questions about implant-supported crowns and bridges please do not hesitate to ask us.